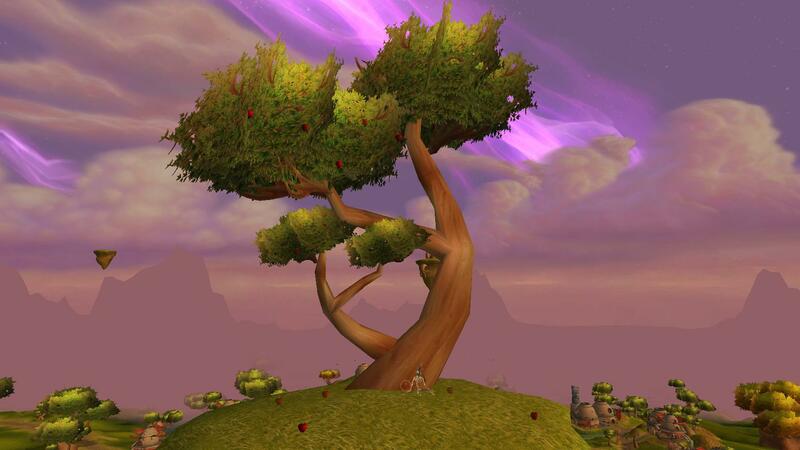 Episode #61 Timecapsule: A pair of solitary destinations can be easily overlooked in the beautiful zone of Nagrand. High up on one of its floating islands, a lone apple tree and skeleton are often considered a “Blizzard tribute” to Sir Isaac Newton. Requiring a flying mount (found southwest of the Throne of Elements), the Newton Apple Tree was one of the last-discovered secret places in all of the Outlands. The Nagrand Tomb is a second scene that fills the WoW explorer with a sense of wonder. This tranquil location has no known backstory in the existing Warcraft lore, yet its remote location in the far western mountains will reward the visitor with a stunning view. This entry was posted	on Tuesday, December 13th, 2011 at 9:54 pm	and is filed under Podcast Episodes. You can follow any responses to this entry through the RSS 2.0 feed. You can skip to the end and leave a response. Pinging is currently not allowed. I knew about the tomb but not the tree, Ill have to go and check that out now. I hope you get a chance to do a show on Darkmoon Island..or two..that place is full of secrets. Thanks, that was some fascinating stuff. If we’re going the route of believing the skeleton represents Isaac Newton, the fact that he’s been killed may be an acknowledgment that the Nagrand Zone basically has “killed ” the laws of gravity. I also noticed what appears to be a shield next to him is the same model of something that sits in Challe’s hut. Another great article based in Outland. I’m levelling my main (I’m still a relatively new WoW player) through Outland at the moment so a very relevant article for me! I found this tree once and couldn’t figure it out! So glad you did a podcast on it! Really interesting observation on the inverse law-of-gravity. In addition, I didn’t notice the shield model at the tree being identical to the one at Challe’s hut. I am grateful for the information & very glad you enjoy the show!